Guided an Escatawba Group Trip, David Carter, Greensboro, Pat Bergeron, Roanoke, VA. Met David and Pat mid morning, we opted for a later start after a four hour drive through heavy snow last night all the way from Emmett, TN to Salem, VA, it snowed like crazy. Did I say it snowed like crazy? It was very cold. Low 15F, in the low 20sF when we started at 930am and wind 25 to 35mph out of the northwest. The kind of wind that makes you regret the decision to come out. We geared up and hit the lower half of the river first, fished several deep slow pools and landed maybe a dozen fish before lunch. 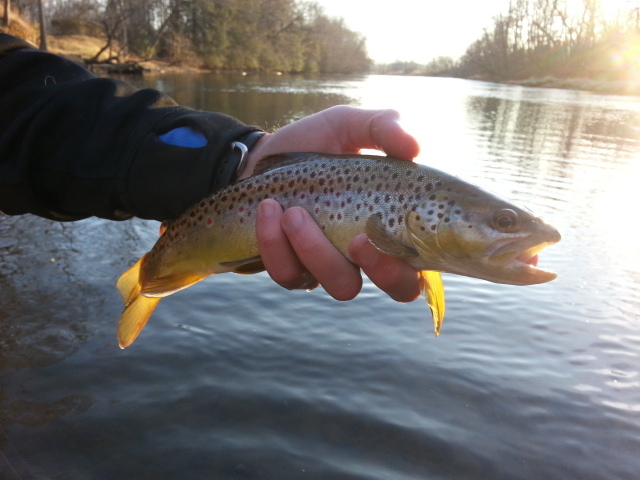 The water was chilly, 34.5F to be exact, and the fish were quite lethargic. They were kind of tough compared to how they can be here. We fished through several spots and took a lunch break about 1pm. 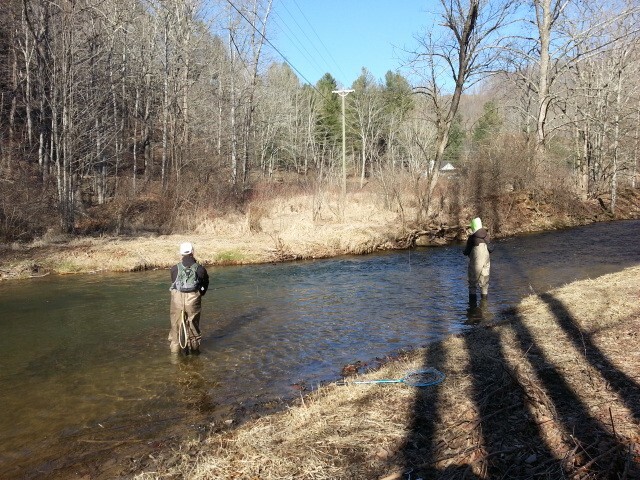 We then headed upstream and it warmed to at least 31 to 32F, which is pretty much all it warmed to today. It was game on , the guys did pretty well, landing maybe 15 more fish. 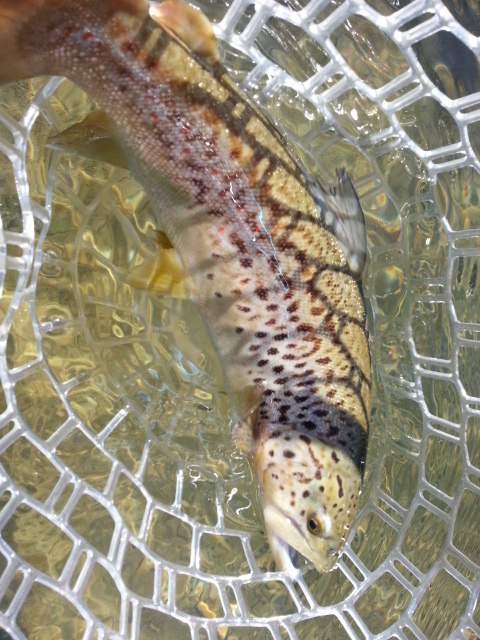 I think we ended the day with about 25 to 30 total, browns and rainbows. Caught them on a variety of stuff, it was a catch one or two and change flies kind of fishing. But it was decent, albeit one of the coldest days I have fished in a while…at least how it felt today, we quit about 545pm and called it a day. Headed out early this morning, guiding Ho Lee from Davidson, NC, and Ho and I are doing a trip in the NC Mtns. Hopefully all the snowmelt from up high won’t mess us up too bad. Chilly start though, 19F as a matter of fact, but weather folks are saying 50F for a high. Been a while since we have seen that, I’ll believe it when I see it. Blue Winged Olives in a Blizzard…..
Wed. Mar. 26, 2014…. 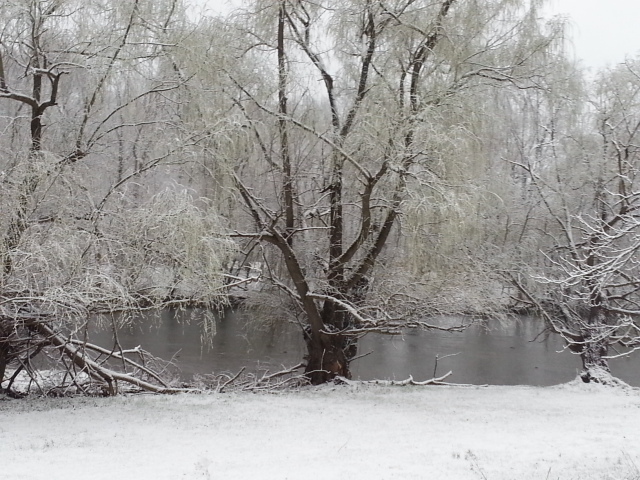 Its chilly in Central VA this morning, in the teens and a lot of snow on the ground. 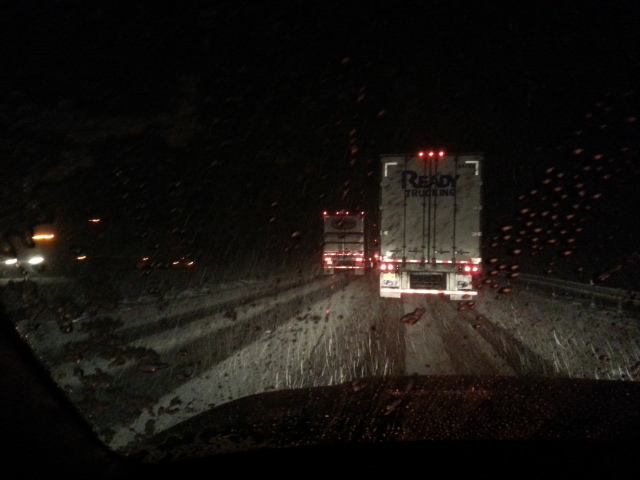 Drove yesterday evening through over 4hrs of a driving snow…which is why this report is late. It was incredible, almost whiteout conditions that stalled traffic down to 5 to 10mph for long stretches of I-81. It was one of the toughest drives in some time for me….a one and a half hour drive that ended up being over 4hrs. 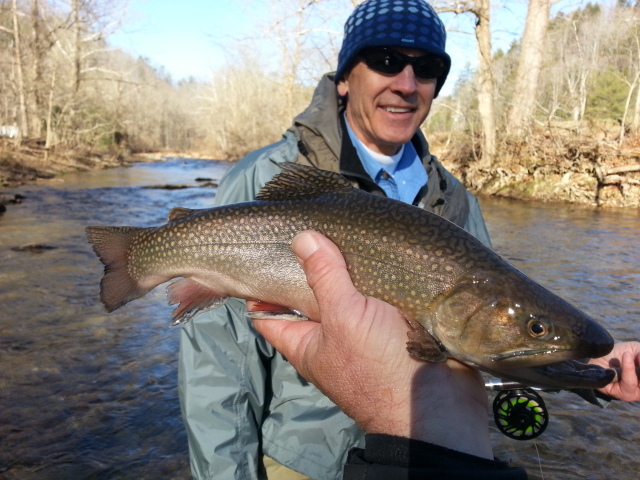 Had a good day yesterday, Ken Okorn, Bob Thompson, Tom Houf, Tom Brennan, Mechanicsburg, PA, TN South Holston, I knew it could be good as the TVA is running a 200 cfs sluice through April 4, we started pretty early….interesting day, we had 2 to 4″ of snow to start, I drove over to the house where the guys were staying, we geared up and headed up to the first spot we’d fish. 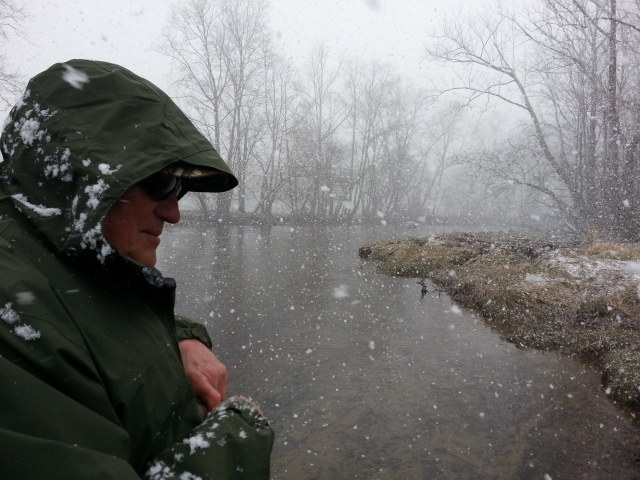 Wasn’t long into fishing when it started to snow again….and it would do so on and off all day. The first place we fished we caught a good many fish, all nymphing, and also on some larger nymph patterns…even large split cases. We fished a long stretch, the guys landed probably 30 or so, probably half of them quality fish. 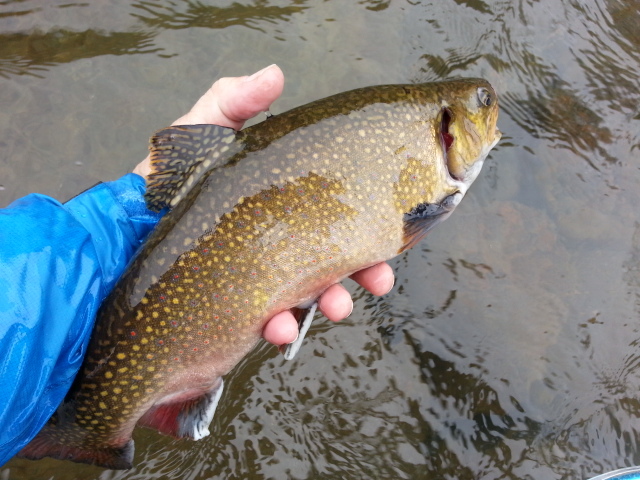 We ate a quick lunch in the car, then headed to another spot upriver to look for a hatch . Heavy snow showers and brutal wind, like 30 to 40 mph at times. 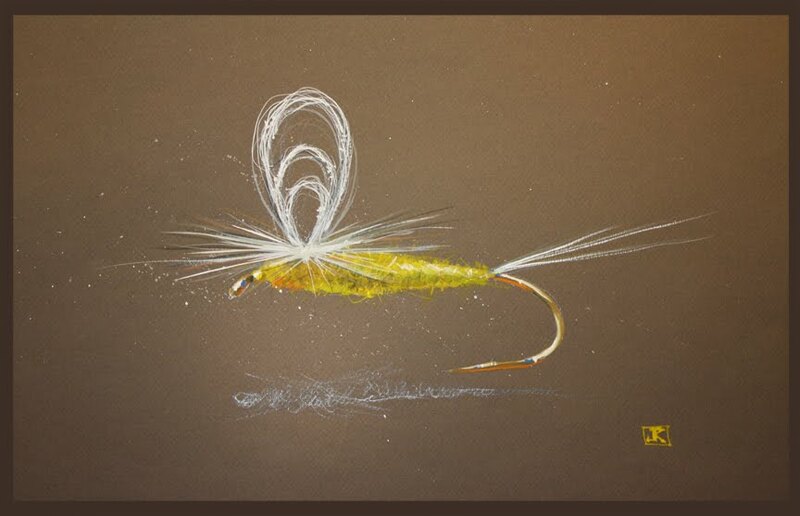 We did find sporadic risers, and also a few blue winged olives……and we ended up catching fish there nymphing, on dry /dropper rigs, and on some bwo dries…one new fly in particular I have been using /tying …..a vertical bwo emerger that really did the trick. Caught maybe 20 or 25 more fish in the afternoon before calling it a day. I am guiding David Carter of Greensboro, NC, and Pat Bergeron of Roanoke, VA, and we’ll be fishing private water. Going to be a cold day, highs will struggle today to get above freezing, going to be an ice in the guides kind of day I am sure. 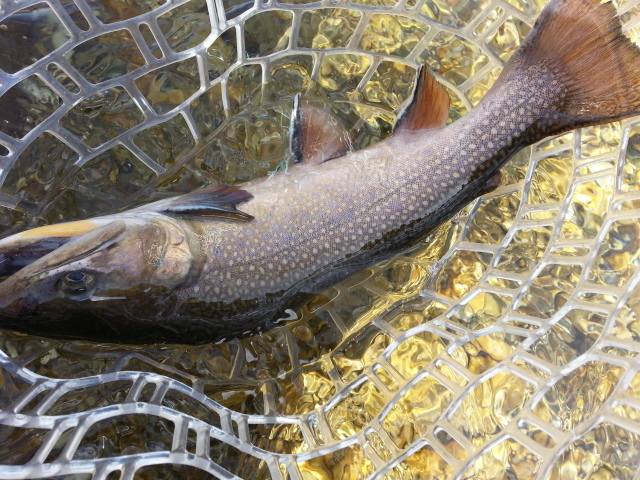 But we should do really well, the water is in great shape, running at a little over 165cfs….and that can be dynamite. Mon. Mar. 24, 2014….Great day today, guided Dennis & Rachel Buchheit, Chicago, IL. Dennis and Rachel were here on a few days vacation, and the day started off really chilly, like mid 20sF. We had a great day though it was quite cold early. By 930am or so the fish were in full swing and we did very well. 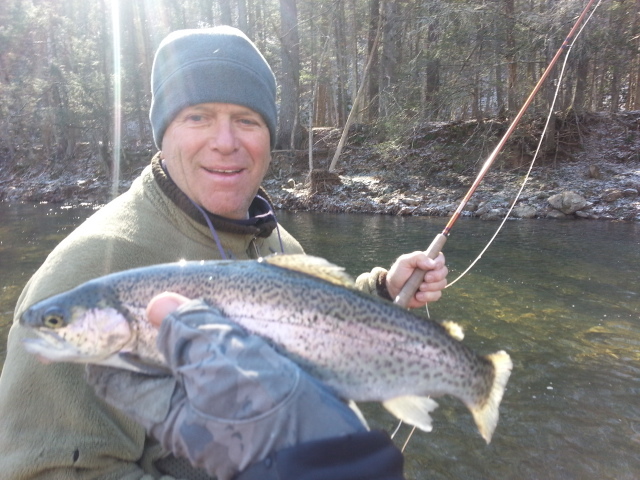 Chilly water, like 36F, so nothing in the way of dry fly fishing or surface activity. Nothing. 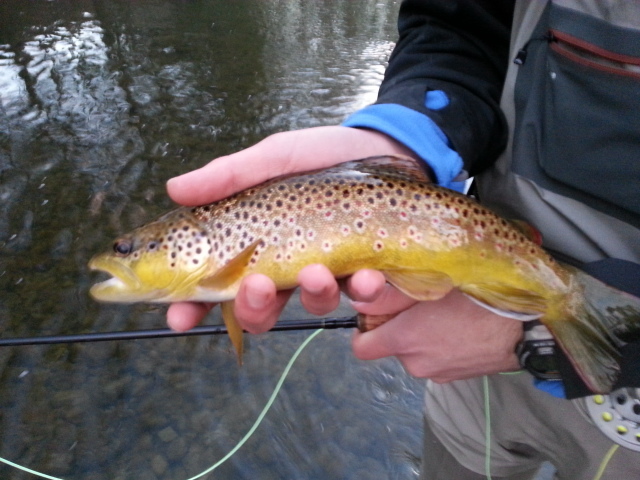 We fished a variety of double nymph rigs, did really well on large flies to start then smaller flies as the day wore on. 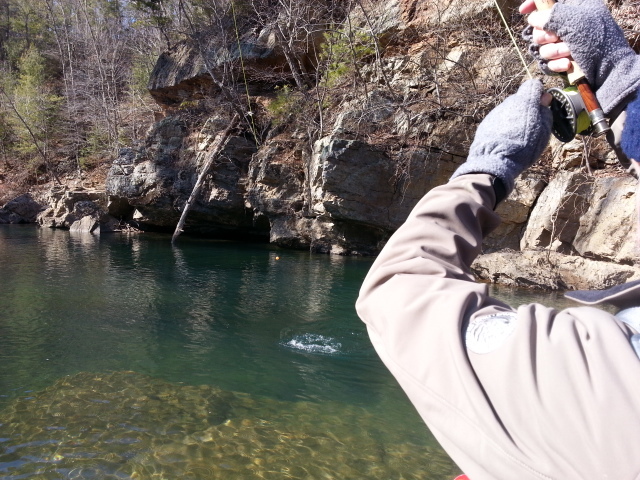 We fished two different waters and landed probably between 40 and 50 fish. 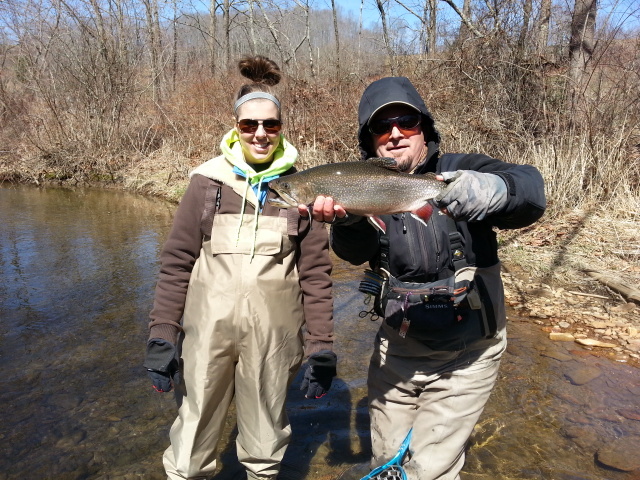 It was great, we fished to some bigs , Rachel landed a citation brook trout that was 21″ and we had one or two large rainbows on that came off, plus fished to a brown that had to be in the 23 to 25″ range. 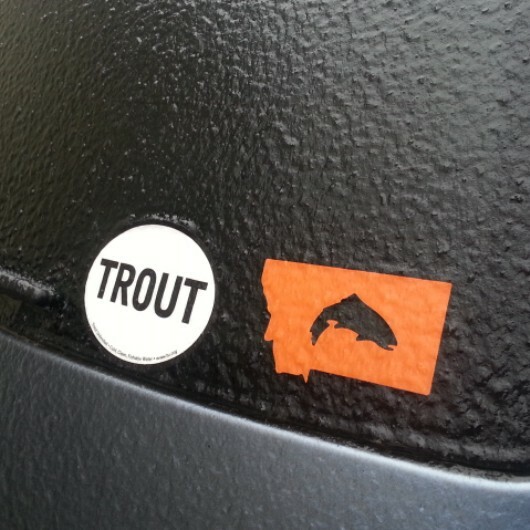 Got a couple of looks but not today…..but I know the fish and where he lives……..and we’ll be back. We finished up about 530 or so and called it a day, just ahead of an incoming Winter Storm or Winter weather system. Tomorrow could be interesting…. Dennis and Rachel were a delight to spend the day with…we had a great time. Looks like Tuesday could have some interesting weather, I’ll be on the South Holston guiding Ken Okorn, Tom Houf, Tom Brennan, and Bob Thompson, all coming from Pennsylvania. The TVA started a 200 sluice today and that is phenomenal. Phenomenal. Phenomenal. Did I mention that that is phenomenal? Should have some good nymphing to start and some olives later in the day. Mon. Mar. 24, 2014…. Chilly this morning in the hills, low 20s in fact. Highs today in the 40s, I will be guiding Dennis Buchheit who is here with his wife for a few days from Illinois. We should have a good day. Things change tonight as a spring winter storm lurks to our west. Will be interesting to say the least…. 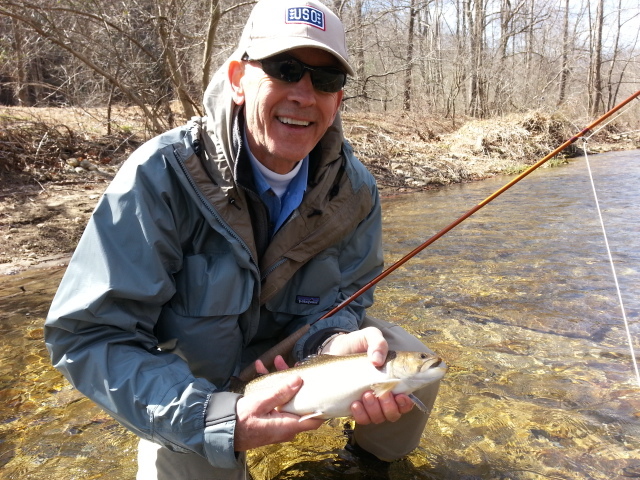 Wed. Mar.19, 2014…..Great morning of fishing under a gray sky, was guiding Mac Cheek , Greensboro, NC, and we had great fishing all day. Landed about 15 to 20 before lunch then probably 25 after lunch. 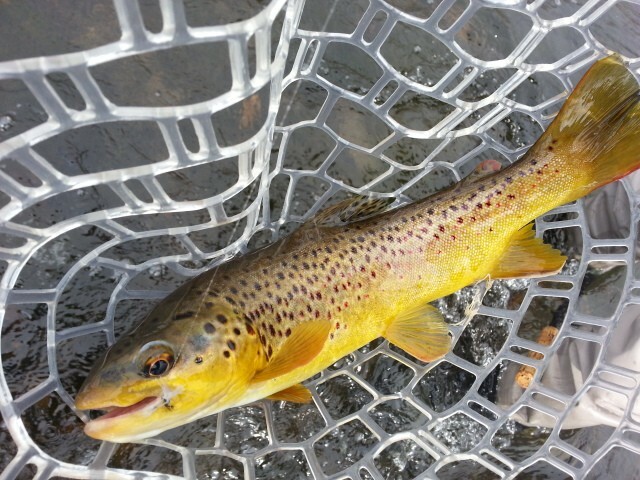 Caught them on nymphs as the water was chilly upper 30s. 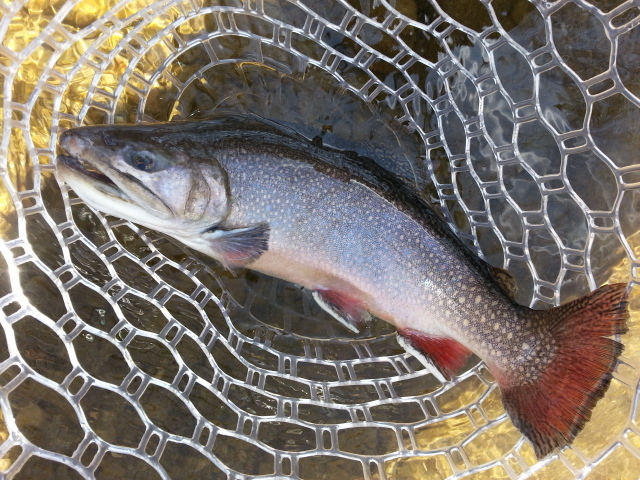 Landed two citation brookies one 19″ and one 20″, and had on a brown…a hook jawed male that I would have guessed at about 25″. 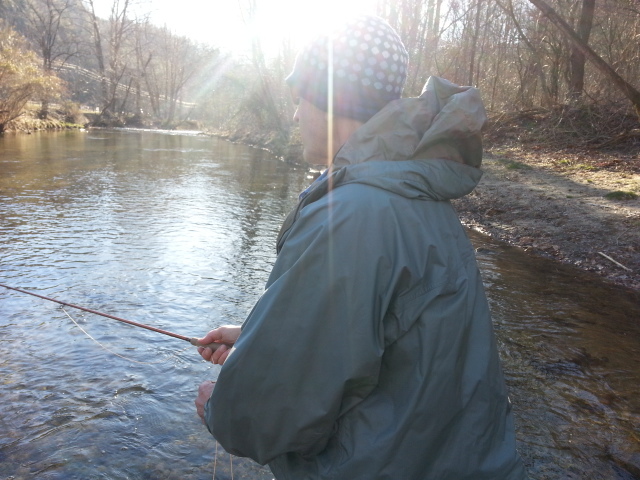 Mac did a good job playing it but the fish made one last run downstream and broke off. The fish broke 3X…..we were sick. We fished one last spot and did well and finished with probably 50 fish. On that we called it a day. Have a great evening. ..! Wed. Mar. 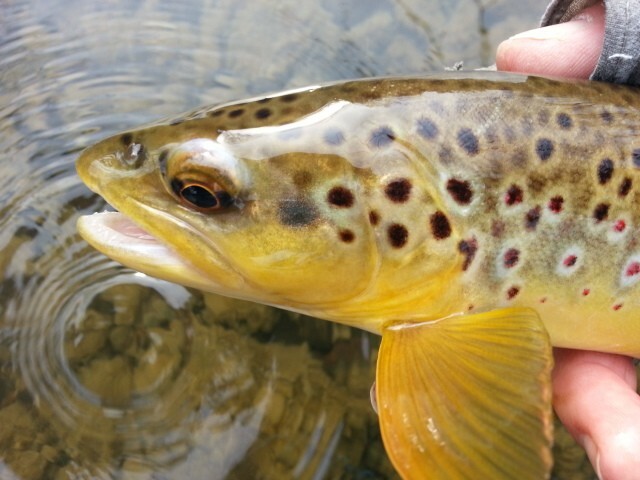 19, 2014….Great day so far guiding Mac Cheek we have had a good morning landing about 15 fish so far including one 19 inch brook char. Doing well nymphing but looks like a blue winged olive day…. Wed. Mar. 19, 2014… Nasty weather week so far, yet another ice event. Winter Weather Advisory for the NW Mtns where we are, roads aren’t too bad but shoulders still littered with lots of abandoned vehicles. Will be guiding friend and client Mac Cheek of Greensboro, NC and we will be fishing the New R. Should be a good day, hopefully the threat of weather today will enable us to have the place to ourselves. Today is a blue winged olive day for sure. Sat. Mar. 15,2014…..First morning in a long time I have gotten up for a trip and the temp was above the freezing mark. Feels kind of nice for a change. Headed out to guide Todd Baker and his two sons Caleb and Caden. Should be a nice day, might be crowded. But we should do fine. Rain returns tommorrow and another round of wintry yuck for Sunday and Monday. Fri. Mar. 14, 2014…..Today’s trip …Ron Rhoades, Greensboro, NC, NC Mtns, looks like a nice day today. Should do really well…..that is what I had posted this morning. It was exactly like that , except with an asterisk***….it was cold as the dickens to start. Like low to mid 20Fs, and it was slow to warm up. Nice day, and nice temps, albeit breezy….if you were up on the bank. If you were in the river, different story. A 20 mph breeze constantly blowing across the water…..it was cold. It was nice by the time we called it a day but it was still chilly on the water. We slayed them. Been saying all week that it has been good, it continues to be just that. Wait a minute. Let me rephrase that, as I mis—spoke. It was phenomenal. Ron was learning to fly fish, I’d say he got three to four trips worth of catching in today, we fished for a half day and did really well. A rough estimate…40 or so….plus a lot of ones that were missed or came off after a brief hookup. A ton of brookies and rainbows, zero browns. 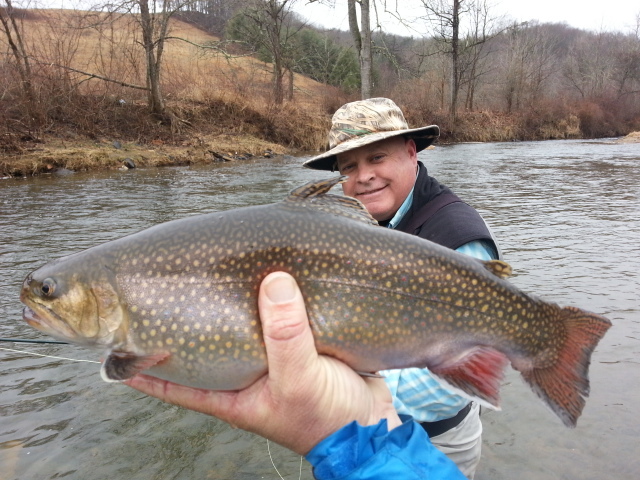 One of the brookies was close to the 17 1/2″ mark, making it officially a citation fish. Only saw 3 rises all day…but then again, no bugs and the water temps plummeting to the upper 30s after two cold nights and one cold day and that’s what you are going to get. 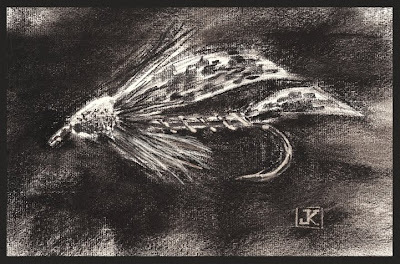 You could have stared at a dry fly all day and catch one or two fish, but didn’t see any point in it when we could get into a gazillion underneath. Prime nymphing conditions. And a handful of new fly rigs did the trick…fished several double rigs with a large attractor up front and one of our RX Tunghead Rubberlegs as a dropper…black, olive, tan, brown…pick a color. Didn’t matter, although brown w/black tunghead did a real number on them. 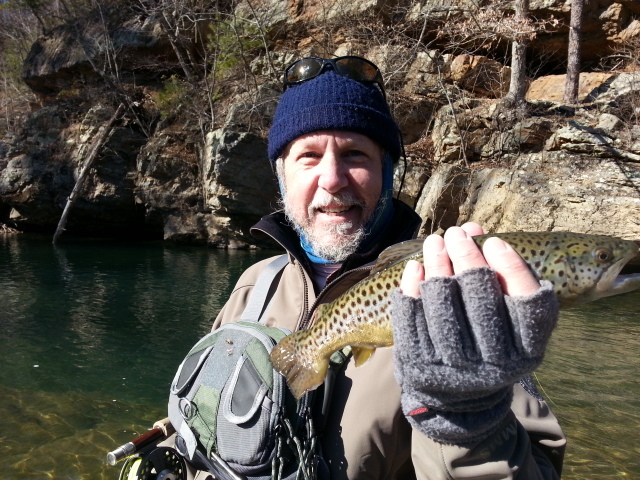 Also caught a ton on a yellow sally stone imitation called a ‘NorFork” Special. It was great. Ron was great, great to spend the day with……superb day but I’d better get to unloading and rigging up some stuff for tomorrow’s trip. Will be doing another trip tomorrow with a father/son group, Todd Baker and his sons Caleb and Caden. Looking forward to another brisk (COLD!!!!) start. Probably will be in 20sF, to above freezing by 10am, 45 by midday, 60 by early afternoon but not much more than that. I don’t put a whole lot of stock in that this time of year from a comfort standpoint. Body temp 98F….put that 2 ft deep in 38F water, add in air temps and wind, and it will feel more like 40 than 60 in the river. Maybe a little warmer if its not windy, but until the water warms a little don’t expect to wet wade or jump in in your bloomers just yet (bloomers would be East TN vernacular). Simply put, be positive, think warm, but don’t leave the layers at home just yet. 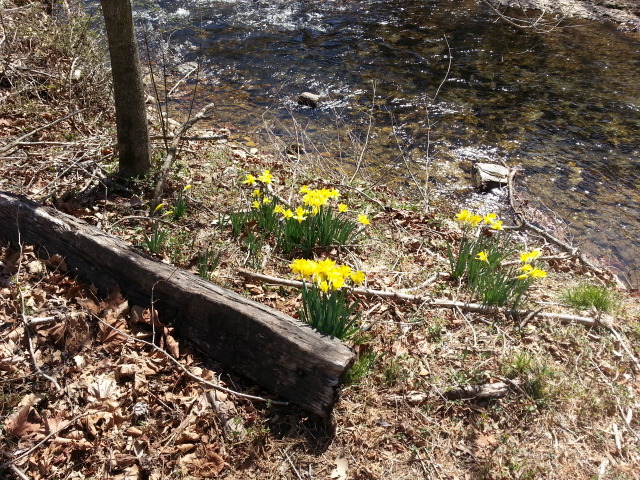 Its still March in the High Country, and above 2000ft its still very much winter. Very much. Clear Water defined. New Zealand has always been some sort of standard for clear water…but it has nothing on a number of our Waters in that regard. Nothing. Fri. Mar. 14, 2014…..Headed out today and Looking forward to a good day. Doing a half day trip with Ron Rhoades of Greensboro, NC. 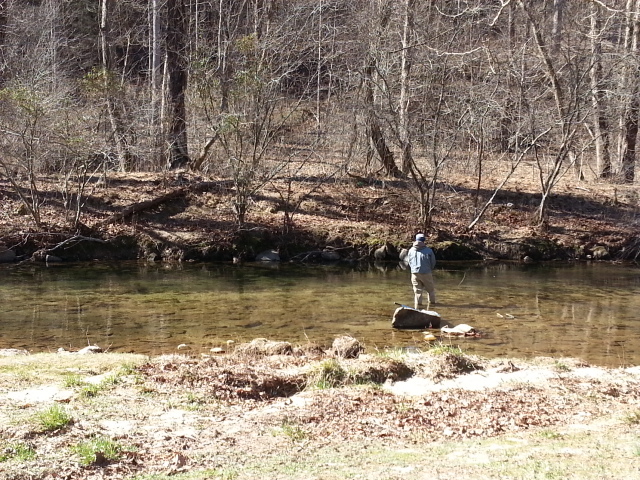 We are fishing on the NC side of the hills and should do well. It’s been chilly but we should still do quite well. Fishing has been great….it’s time to do business…. Have a great one, more later from the stream….